Definition at line 13 of file CREWrapperFormulae.h. Definition at line 3 of file CREWrapperFormulae.cpp. Definition at line 8 of file CREWrapperFormulae.cpp. 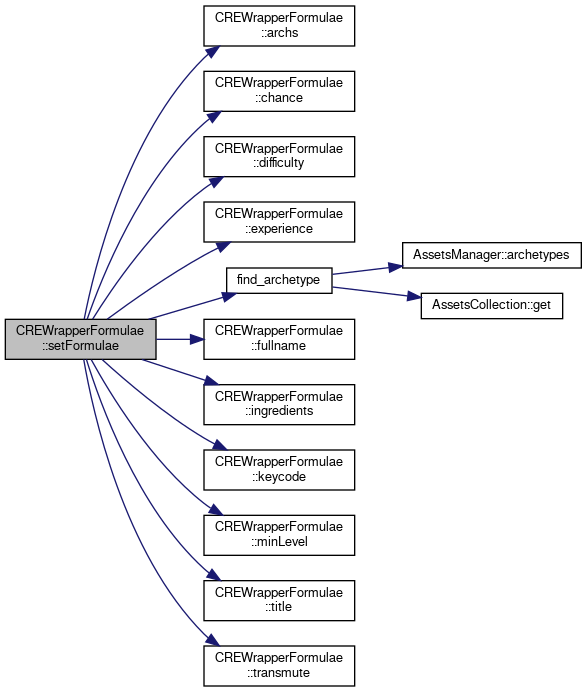 References recipestruct::arch_name, recipestruct::arch_names, archs(), recipestruct::chance, chance(), archt::clone, recipestruct::diff, difficulty(), recipestruct::exp, experience(), find_archetype(), fullname(), recipestruct::ingred, ingredients(), myFormulae, obj::name, linked_char::next, recipestruct::title, and title(). Definition at line 39 of file CREWrapperFormulae.h. Referenced by CREWrapperFormulae(), and setFormulae(). Definition at line 22 of file CREWrapperFormulae.h. Definition at line 19 of file CREWrapperFormulae.h. Definition at line 20 of file CREWrapperFormulae.h. Definition at line 21 of file CREWrapperFormulae.h. Definition at line 17 of file CREWrapperFormulae.h. Definition at line 23 of file CREWrapperFormulae.h. Definition at line 18 of file CREWrapperFormulae.h.